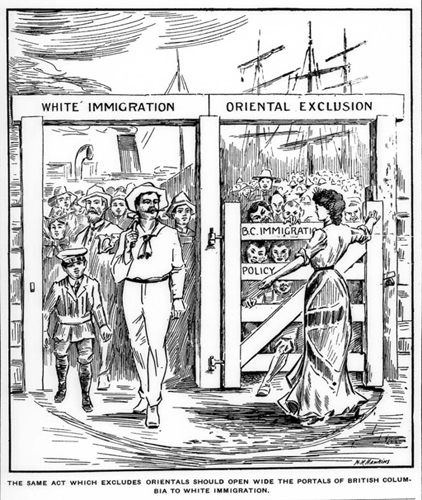 "At any moment when the Legislature of Canada chooses, it can shut down the gate and say, no more immigrants shall come here from China; and then no more immigrants will come, and those in the country at the time will rapidly disappear ... and therefore there is no fear of a permanent degradation of the country by a mongrel race." "When the Chinaman comes here he intends to return ... he does not bring his family ... he is a stranger, a sojourner ... he has no common interest with us ... a Chinamen gives us his labour and gets his money, but that money does not fructify in Canada... [he] takes it with him and returns ... he has no British instincts ... therefore ought not to have a vote." "The Exclusion Act, it affected my family in a very real way. During that exclusion period, my grandfather did travel to China several times, but he wasn't able to bring my mother, my aunt, my grandmother over until the Exclusion Act was lifted in 1947." "After careful examination into the losses of Chinese residents of Vancouver, occasioned by anti-Asiatic riots ... total losses ... actual and resultant, amount to $25,990." "From these figures it would appear that the large influx of Chinese into British Columbia during the building of the Canadian Pacific Railway was well absorbed, nearly all apparently remaining in this country or others coming in to take their place." "The whole purpose of the implementation of the head tax was to stop Chinese immigrants, and being awarded Canadian citizenship, he had no idea that he was subject to it as well." 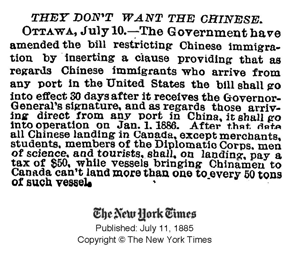 Discrimination against the Chinese began early in Canada's history. While Chinese were present in Canada even before Confederation, in 1867, arriving in the thousands nearly a decade earlier for the Fraser Valley gold rush, they were characterized by the white population as undesirable. Though their reasons for making the journey from China to "Gold Mountain" were similar to those of non-Chinese explorers and settlers, they suffered legislated discrimination, especially around the building of the Canadian Pacific Railway. Politicians in British Columbia were vocal in their opposition to the presence of Chinese in Canada. Anti-Asian sentiment spread from the West Coast to the Dominion Parliament. Many feared Chinese would take over the work of white labourers, especially on the railway. They also believed the Chinese were too alien in their manner and custom, and that they could not be integrated as British subjects. Before British Columbia joined Confederation in 1871, local politicians were agitating to exclude the Chinese. Legislative Council member Arthur Bunster, himself an Irish immigrant living in Victoria, proposed an annual poll tax of $50 on every Chinese worker. No vote was taken, but Bunster received public support from Amor De Cosmos, publisher of Victoria's influential British Colonist newspaper, and later the province�s second premier. Organized labour also opposed the Chinese presence in Canada. Prominent B.C. politicians took up their cause, including De Cosmos, Bunster, John Robson and Noah Shakespeare, pursuing restrictive legislation and sometimes leading such groups as the Anti-Chinese Society, the Workingmen's Protection Association, the Anti-Chinese Association and the Miners� Mutual Protection Association. The Chinese were tolerated during the construction of the CPR, but the tide of political opinion was about to change, as workers laid more track and neared completion of the railway. On November 7, 1885, the last spike was driven into a railway tie near Craigellachie, B.C., linking the western and central sections of the Canadian Pacific Railway. By then, Parliament had already swayed against the Chinese. Ironically, the labours of the Chinese worked against them, as anti-Asian sentiment spread more quickly with the ease of travel, communications and trade between British Columbia and central Canada. The same year, Parliament heard the report of the Royal Commission on Chinese Immigration, in which supporters of importing Chinese labour squared off against its opponents. At the same time, the Electoral Franchise Act was also making its way through Parliament; it passed with an important amendment forwarded by Macdonald that an eligible voter was "a male person, including an Indian, and excluding a person of Mongolian or Chinese race." Parliament acted quickly on the recommendations of the Royal Commission, in which one of two commissioners, Justice John Hamilton Gray, had suggested imposing a head tax of $10 on every Chinese man, woman or child disembarking from a ship. 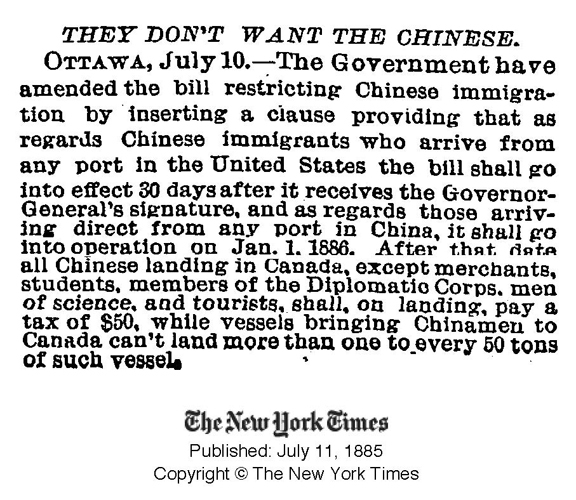 Lawmakers in Ottawa went further with the Chinese Immigration Act (1885) that imposed the first head tax of $50 on all Chinese entering Canada. The Act also limited ships carrying Chinese to one per every 50 tonnes displacement and established a system to collect the head taxes from a ship's captain before any crew or passengers could disembark. Further amendments to the Act in 1900 increased the head tax to $100, and in 1903 the amount was raised to $500. In stark contrast, Canada offered preferred European immigrants free land to settle in certain parts of the country. The head tax began 62 years of legislated racism against Chinese in Canada. On July 1, 1923, as Canadians celebrated Dominion Day, Chinese and their families were dealt another blow by the federal government. The head tax was replaced by the Chinese Exclusion Act. For many years, Chinese Canadians referred to what later became known as Canada Day as "Humiliation Day." The various head taxes paid by Chinese immigrants added about $24 M to federal and provincial coffers, nearly enough to pay the cost of the western section of the Canadian Pacific Railway. The head tax was a big source of revenue for the Canadian government, which didn't collect income taxes until after World War I because it wanted to provide an incentive for preferred immigrants. The Chinese Exclusion Act, formally called the Chinese Immigration Act (1923), barred all but a few Chinese from entering Canada until it was repealed in 1947, largely due to the actions of Chinese Canadian civil rights activists, including some Canadian-born Chinese war veterans. 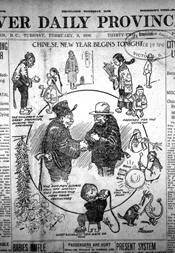 The Exclusion Act brought further hardship to Chinese living in Canada. 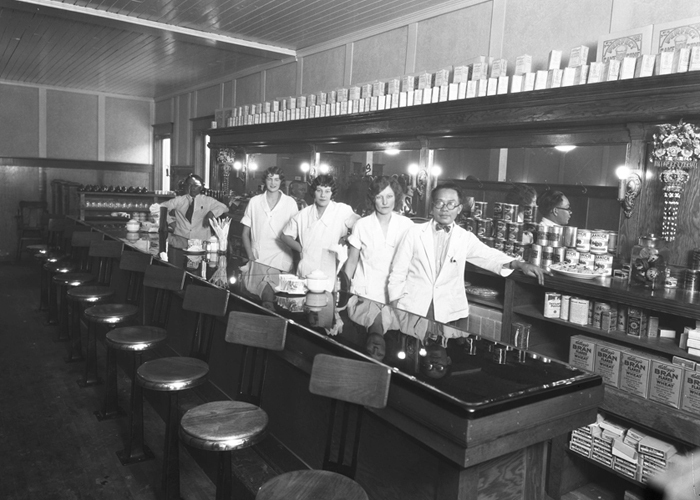 Disenfranchised federally, and by some provinces and municipalities, they were also excluded from many businesses and professions, including law, accounting, engineering and pharmacy. Professional organizations at the time required members to be included on voter's lists to obtain certification. Many Chinese bachelors, who stayed on after the railway was built, but who couldn't afford to bring their families to join them, ran laundries, cafes and restaurants, which required less capital to operate. They also relied on other Chinese to staff their businesses, because of other discriminatory laws that limited opportunity for them. Family separation became a reality for many Chinese, enforcing the notion of a "bachelor society" of single, Chinese men living in isolation. Many were actually married and had families, but they were forced by the Exclusion Act to live alone in Canada. There are many stories of parents and children not ever living together, or even seeing each other during their lifetimes. By the late 19 century, the British Columbia economy was booming, with established industries in mining, lumber and fishing. The railway brought more European settlers, mostly from the British Isles, from east of the Rocky Mountains. The Chinese and other Asian populations increased in number, but at a mere trickle compared with immigrants from Europe. Canada's first census in 1871 recorded the Chinese community in British Columbia at 1,548 - a mere fraction of the total provincial population of 594,207. As the economic activities of building a new nation boomed, so did the population, reaching 643,871 in 1891, with 9,129 identifying China as their country of birth. By 1901, national census figures show an overall Canadian population of 5,371,315, including 17,312 from China who represented less than a third of a percentage point of the population. British immigrants numbered 3,063,195, mostly from England, Ireland and Scotland. Still, white angst and disproportionate fear about an expanding Asian community led to further discrimination, including violent outbursts � none more so than the Vancouver Race Riots. On September 7, 1907, a meeting at Vancouver's old city hall of the Asiatic Exclusion League, cobbled together by politicians and labour organizers using racism as a political tool to unite the white population, resulted in a mob rampaging through Chinatown and Japantown. Shop windows in the heart of the Chinese community, along Shanghai Alley and Canton Alley, were shattered with extensive damage to property. To its credit, the Chinese community rallied and demanded damages be paid. William Lyon Mackenzie King, then deputy labour minister, was appointed to investigate the claims. He met with representatives of the Chinese government, including Tung Cheng-King, attaché of the Imperial Chinese Legation in London, England, and two consuls from San Francisco and Portland, Oregon. At the time, China had no diplomatic representation in Canada. On completion of his investigation, King recommended payment of $25,990, plus $1,000 to cover legal expenses. It was a small victory for the Chinese Canadian community, but it was followed by more federal measures to prohibit Asian immigration to Canada. On the heels of the federal inquiry into damages sustained by the Chinese and Japanese communities in the Vancouver Race Riots, William Lyon Mackenzie King was appointed to lead the Royal Commission on Oriental Immigration. Instruction from the Secretary of State on October 4, 1907, cited "a largely increased influx of Oriental labourers" into British Columbia as reason for the inquiry. While Japanese and South Asians were included, the inquiry paid special attention to the Chinese. Importantly, King's final report acknowledges that the Chinese, after the railway was completed, no longer appeared as "a sojourner in a strange land, for his own purposes for a while," as described earlier by Prime Minister John A. Macdonald. King�s report noted that the 1891 census, done six years after the railway was completed, found between 9,000 and 10,000 Chinese still living in Canada. The report also discussed the effects of the various head taxes levied on Chinese immigrants. King found that increasing the amount of the tax from $50 to $100 and finally to $500 had a paradoxical effect. The lower levies were inadequate to stem Chinese immigration. However, the higher $500 head tax worked against the intended outcome of stemming the flow of Chinese immigrating to Canada by creating higher demand for a limited supply of Chinese workers. 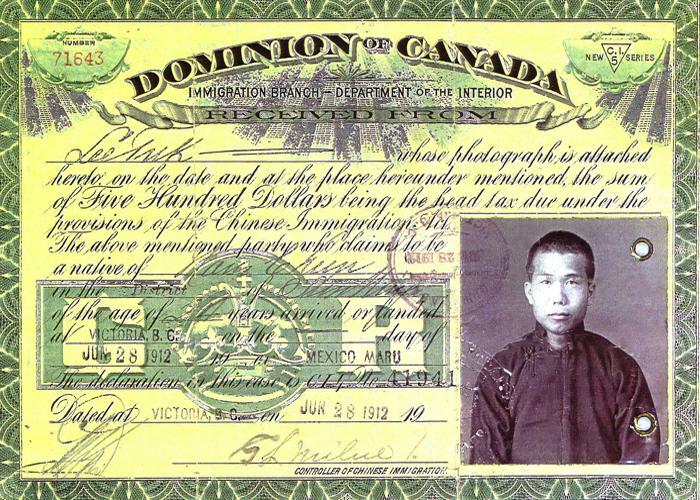 Labour contractors, including Vancouver merchant Yip Sang, testified to the Royal Commission that the cost of employing Chinese workers had doubled, if not trebled, since Canadian immigration and customs officers began collecting the $500 head tax from arriving Chinese on January 1, 1904. For the Chinese who could afford to pay the head tax, immigrating to Canada was still worth the risk of leaving China and their families in hopes of building a better future. The provinces also enacted laws to disenfranchise the Chinese. British Columbia wrote laws to remove voting rights for First Nations and Chinese in 1876. Saskatchewan removed suffrage from Chinese in 1908. Alberta also considered disenfranchisement, but no such law was passed. Being on the provincial voter�s list was necessary for inclusion on the federal voter�s lists. In some associations and organizations, particularly those representing various businesses and professions. Chinese were relegated to menial labour and services. While B.C. 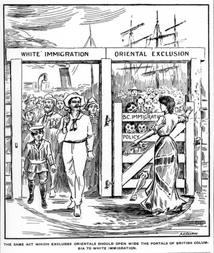 politicians worked hard to exclude the Chinese from all aspects of society, and to limit the community's ability to challenge laws designed to disadvantage them, anti-Asian sentiment had spread east. 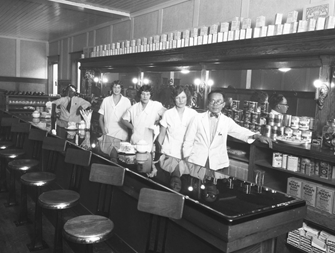 In 1912, Saskatchewan implemented its White Women's Labour Protection Law, officially called an Act to Prevent the Employment of Female Labour in Certain Capacities, which banned white women from working in "any restaurant, laundry or other place of business or amusement, kept or managed by any Japanese, Chinaman or other Oriental person." It was one of many measures enacted to undermine competition from Chinese business. Even when laws appeared to grant universal rights, Chinese encountered discrimination because of their race. 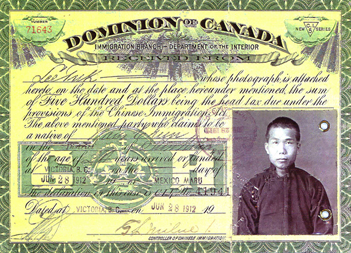 Chinese railway worker Yong Hong Yan, father of Toronto artist Judi Michelle Young, was able to obtain papers to become a naturalized Canadian citizen in 1899, but customs officials who had wide discretionary powers still made him pay the head tax when he returned from trips to China. In 1906, Newfoundland and Labrador, then a separate British dominion, passed its own Act Respecting the Immigration of Chinese Persons, which levied a $300 head tax on all Chinese entering its territory. The Act was removed when Newfoundland became part of Canada in 1949.